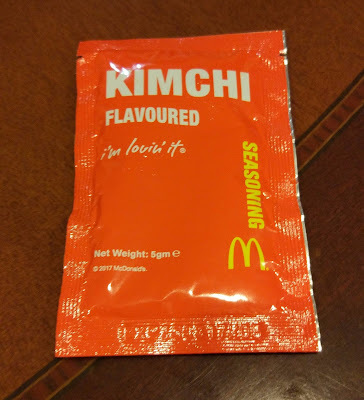 The Seoul Spicy Chicken and Beef burgers I reviewed last week, weren't the only Korea-themed items available at McDonald's Singapore on my last trip. 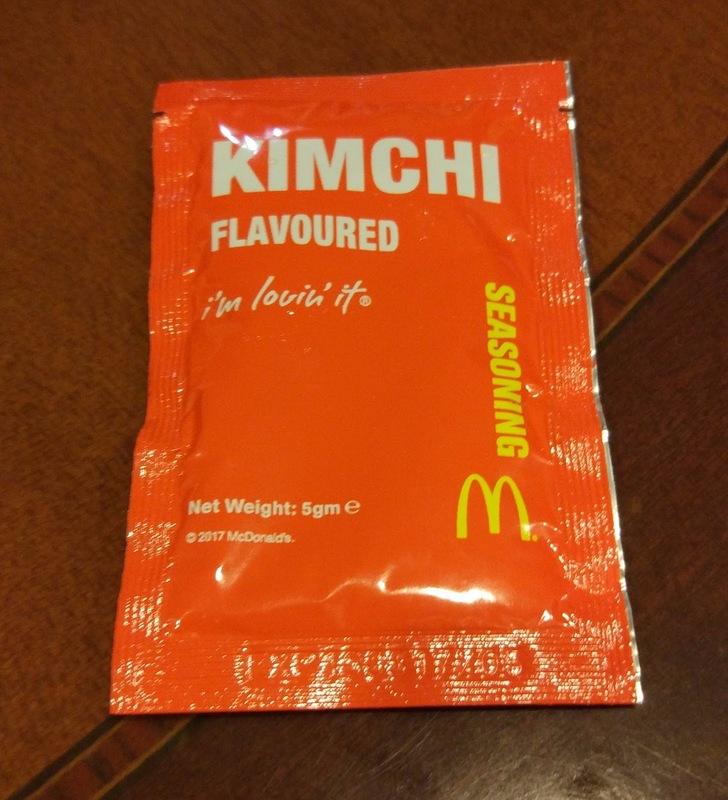 Kimchi Shakers were released as a part of the promotion, and they have to be some of the strangest flavoured Shakers McDonald's has ever come up with and over the years, I've had some weird ones. 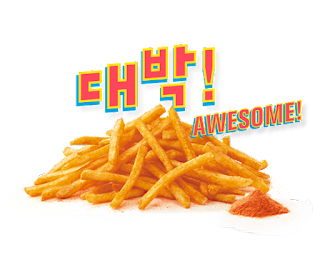 Now, I'm not sure if the absurdness comes from living in Korea for 4 years (and having a Korean wife), but Kimchi isn't even something eaten anywhere near french fries, nor is it a flavour used on snacks, potato chips, or anything else that might need a seasoning. Kimchi in Korea is pretty much exclusive to Kimchi. 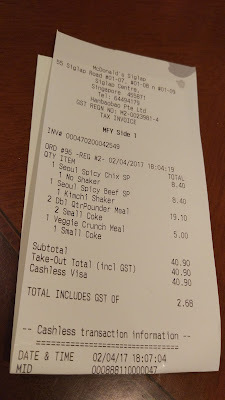 To be completely honest, when we placed our order, the burgers immediately went to the side as the first thing both The Wife and I wanted to try were these shakers as we both wanted see how bad they would be. I'm sure anyone that's been caught up in the Korean food craze that's sweeping most countries knows kimchi to be the traditional "fermented cabbage" version that you'd find at any Korean restaurant and supermarket. But if you aren't familiar with the actual history, and various different versions of kimchi you should go check out the Wikipedia page about it. There's a whole world of kimchi you've never had before and some of my personal favourites living in Korea were Cucumber and Spring Onion Kimchi. Not surprisingly, this Kimchi Shaker was trying to recreate the flavours you'd get with the typical Cabbage Kimchi rather than something more obscure, but they weren't exactly going for the cabbage vegetable flavour, but mainly that tart taste you get from the brine that the cabbage is fermented in. 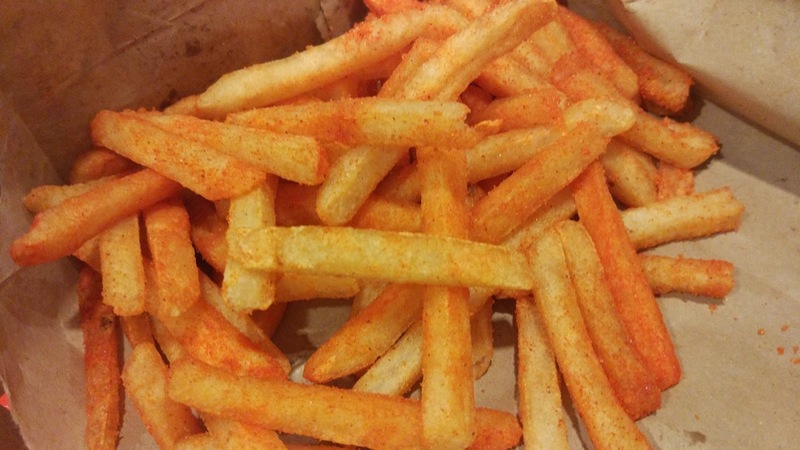 Full disclosure, both The Wife and I went in expecting these to be awful, so when I ate my first fry and actually found it pretty palatable, almost to the point where it was even pretty decent, I was immediately taken aback. The real problem which emerged with these was the lingering, lingering, aftertaste that only got worse the longer it sat in your mouth. Yes, it actually does taste like kimchi brine, but the brine of the kimchi isn't something you really want your McDonald's fries to taste like. 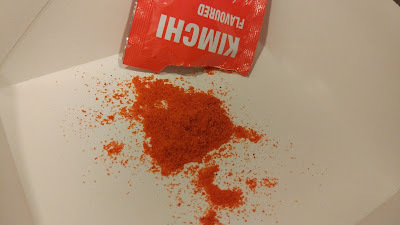 If you look back on various different Shaker flavours, they are typically something that could be repurposed as a potato chip flavour and there's a reason why they don't typically make Kimchi Chips. For any of you that might know the subtleties to certain kimchi, this tasted less like kimchi in Korea, and more like the less-fermented Made-in-China kimchi that is sold in a package and exported. 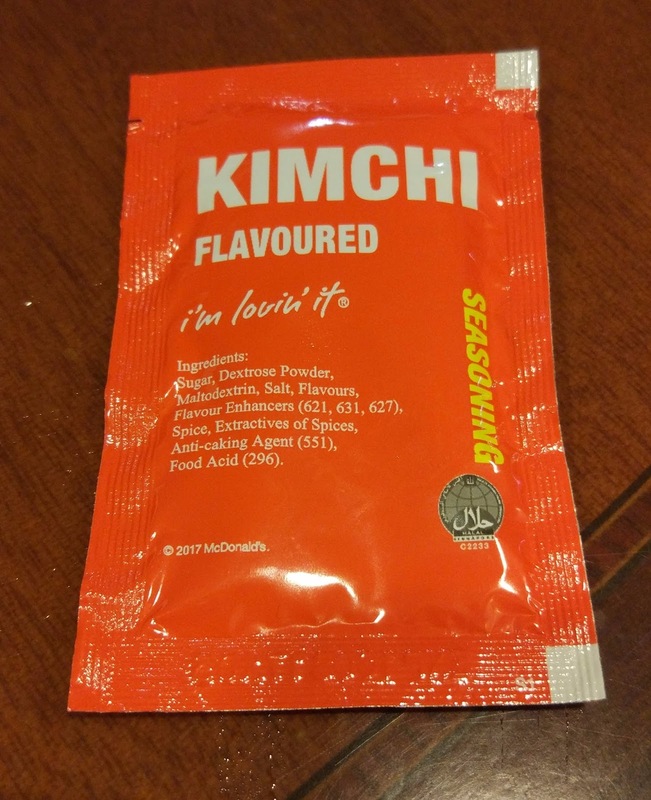 That sourness that comes with that packaged kimchi was also noticeable here, and that's somewhat expected if the flavour was designed in Singapore, as all their kimchi tastes like that variant. I looked through the ingredient list and the one additive was Malic Acid which is used to make food sour, and this same ingredient is also found in Chinese packaged kimchi. The shaker package didn't say which country it was made, but it wouldn't be surprising if it was also made in China. Of the the four adults eating McDonald's that evening, we used one packet of the seasoning which was provided, and between the four of us, we couldn't finish the one serving of fries we used. So even though these did in fact surprise me by how close to kimchi they tasted, no one really enjoyed them enough to eat more than a few fries each. I'll keep the Peach McFizz review pretty light as even when I was able to review a handful back when I lived in Singapore between 2012-2015, none of those reviews ever get that many views, as they just aren't interesting enough, and this 2017 Peach McFizz was no different. You could buy it on it's own for an absurdly priced $3.30SGD, but it was included in the Seoul Spicy Burger "Premium" set together with the Kimchi Shakers for just $0.70 more than the regular combo which made it affordable enough. 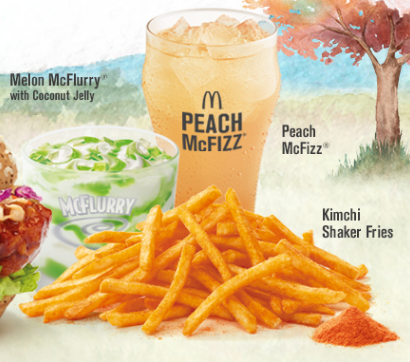 I did however find it a bit strange they marketed Peach together with other Korean items. 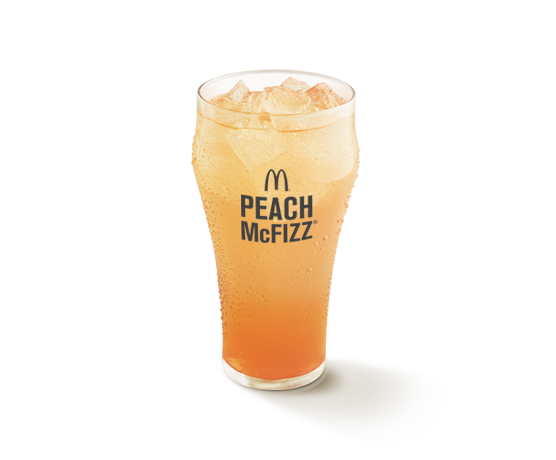 They do grow peaches in Korea, but there are other more traditional Korea-only fruits that they could have made this drink with, Yuja was used in Korea before, and Korean Melon would have been an interesting flavour, but more on Melons in a bit. 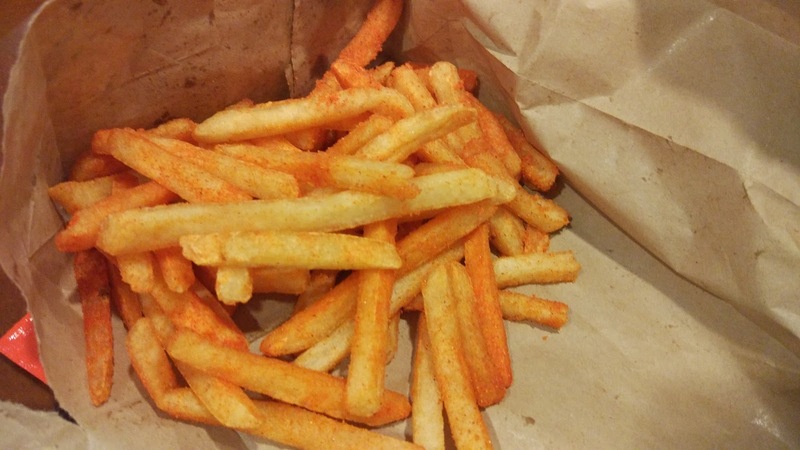 McFizzes are still the same as they were three years ago. Simply Sprite mixed with whatever flavoured syrup that give it the name, and that's about it. On occasion they have had small pieces of actual fruit in the syrup, but not this time. I usually found these overly sweet since Sprite is sugary enough and adding more syrup to it was usually overpowering. This time however the Peach syrup was rather subtle and actually blended together well to taste more like a Peach flavoured Sprite rather than two distinct things just mixed in one. 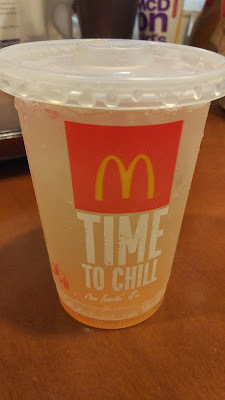 A few years ago McDonald's Singapore had a White Peach McFizz which was one of the worst flavours I've tried, so unless my taste buds changed with age, they've reformulated the Peach syrup for this edition. I think this was the first time I've ever finished a McFizz to the bottom of the cup, and that's a pretty clear indication that it deserves a positive score, even when it's not overly "Korean". 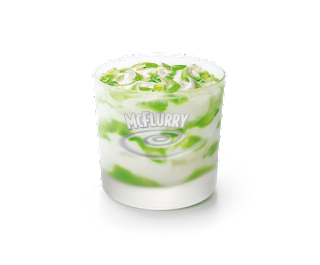 Last but not least would be the Melon McFlurry with Coconut Jelly. 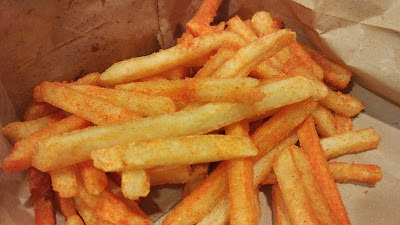 This was the desert side that launched with the Seoul Spicy set, but apparently I was too late to Singapore to find a branch with it still available. I popped my head into about 4 branches over a few days, and each one clearly had SOLD OUT taped over the McFlurry on the promotional poster. I wonder if that's an indication that it was very good, or if they just killed it early. I did have a similar looking Honeydew Melon McFlurry a few years ago, and the syrup looks pretty close to the same, so I might have not missed much. 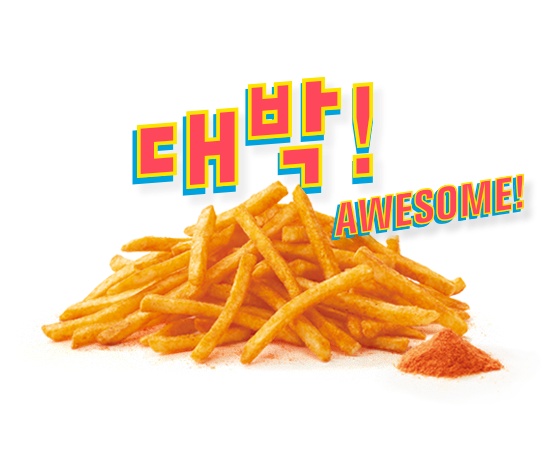 Kimchi fries are a thing in America as a topping more than a seasoning. And as a korean in a non korean US city. My family loves korean peaches every to those are white.